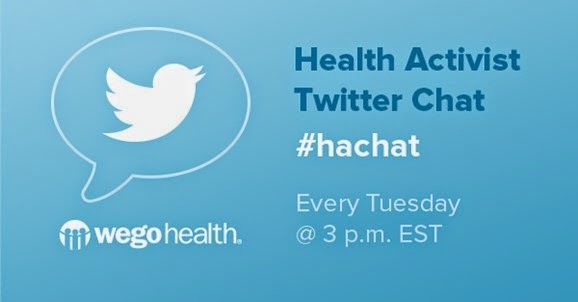 I have been asked to guest host a Twitter Talk for Health Activists by WEGO Health. The Twitter Talk will tale place for an hour between 3pm-4pm EST and 8pm-9pm BST on Tuesday 24th June 2014. I have created a list of questions that I hope everyone will find thought-provoking and will hopefully stimulate some good conversations between us all. The questions will be listed below so you can have a sneaky preview to get those 'little grey cells' and fingers ready to go this Tuesday. If you are unsure what a Twitter Talk is then I'll try to explain what they're all about. Twitter Talks or Twitter Tweet Chats are conversations that have an allocated hashtag (HT, #) that helps link and group all the messages being sent, questions and answers. They usually take place at a prearranged time and sometimes have an agenda or list of questions to help engage and promote conversations between participants. 1. What's the one thing you would like to change most about how medics have dealt/deal with your health condition? What do you think the most important attribute a medic ought to possess? What is the most destructive/disappointing/upsetting attribute a medic can possess? 2. What is the best piece of advice you’ve been given that has helped you cope with your illness? What is some good/valuable advice you might give someone with a similar condition to you? Do you feel it is important to you to share advice and support to other sufferer’s? 3. Do you consider yourself 'ill'? Why/Why not? Do people’s attitudes/opinions of and towards your health have an impact on your overall condition? How do you cope with stigmas or judgements that might be made? 4. Do you struggle with keeping hope and positivity alive? Do you have strategies for this? 5. Do you make sure that you devote equal amounts of energy on 'feeding' your 'soul/spirit' and other interests? If so does this cause difficulties/guilt/concern that you’re not focusing on ‘trying to get better’ or ‘managing your condition’? WEGO Health is a different kind of social network, built from the ground up for the community leaders, bloggers and tweeters who are actively involved in health online. WEGO Health is a platform for committed health advocates to foster new relationships, gain access to helpful resources, and to grow their communities. If you'd like to read more about WEGO Health then click the following link to go to their website www.wegohealth.com which contains a whole host of exciting and interesting information and lots of opportunities to flex your health activism muscles. I really hope you manage to join me and many others for this weeks Health Activist's Twitter Chat at 3pm EST/8pm BST. I really hope you enjoy watching the videos and that they can help you or someone you know. I would love to hear from you if you have anything you would like to say. Sleep disturbances and insomnia can all contribute to a feeling of ill health and can make you more susceptible to illness both in the long and short term. This film contains a few hints and tips on how to create a good routine and prioritise your sleep so that you can feel healthier and happier.